Protestants and Republicans failed, but they did their damnedest to try to keep a Catholic from becoming president of the United States. 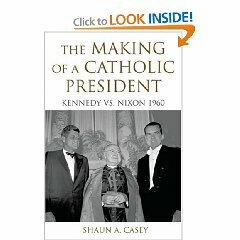 This incredibly detailed account proves — with the hard evidence of preserved letters and memoirs — that under the guise of fighting to preserve the principle of separation of church and state, large Protestant denominations and influential Protestant leaders teamed with the Republican Party and its nominee in the 1960 election — Richard M. Nixon — to feed anti-Catholic prejudice among the large Protestant voting majority. Famous names like the Rev. Billy Graham and Norman Vincent Peale are uncovered as joining in, nay, leading the charge, in order to keep the Catholic Kennedy from the White House. Casey’s research shows how Protestant ministers and church leaders used their pulpits and their printing presses to blatantly state that no Catholic could ever be trusted to uphold the U.S. Constitution as president. The anti-Catholic bias came out via the preaching sermons that attacked JFK, airing radio and television programs that did the same, running lengthy articles against Kennedy in Protestant magazines like Christian Century and Christianity and Crisis, and printing and distributing hundreds of thousands of pamphlets in an attempt to sway the election Nixon’s way. Leading the chorus of anti-Catholicism was the Republican National Committee. If only the American public had known about the duplicitous ways of Richard Nixon during the 1960 presidential campaign, the country may never have heard of a bungled burglary at the Watergate complex because Nixon’s credibility would never have allowed him to even run for the presidency later, no less be elected or approve of criminal activity to try to win re-election. While publicly vowing not to raise the issue of a candidate’s faith, Nixon surreptitiously had former Missouri congressman O.K. Armstrong working the anti-Catholic bias angle across the country with Protestant church leaders and especially the anti-Catholic group Protestants and Other Americans United for Separation of Church and State. Armstrong recruited organizations like Citizens for Religious Freedom, the National Association of Evangelicals, the Assemblies of God and the National Council of Churches to use speeches and printed material to show how a Catholic president would undermine the country. Armstrong worked under the guidance of Albert Hermann of the Republican National Committee, who was the organizer of anti-Catholic forces for Nixon. Casey points out that the issues of the day in 1960 were public funding for Catholic schools, the appointment of a U.S. ambassador to the Vatican, a supposed threat to separation of church and state, and especially the fear that the Vatican would direct a Catholic president in how to govern the country. What comes through the historical evidence is first the fear by Protestant elites that the United States would no longer be a “Protestant nation,” and second that both Protestants and Republican leaders feared Catholic voting power. Interestingly, President Dwight Eisenhower had won the majority of Catholics in both the 1952 and 1956 elections. In going after the anti-Catholic vote, Nixon took up a suggestion from Rev. Billy Graham, who wrote in a letter to the then vice president, “when the chips are down I think the religious issue would be very strong and might conceivable work in your behalf.” Graham in fact shared his mailing list with the anti-Kennedy efforts. Nixon, however, had a problem of his own: Civil rights. In order to gain Protestant votes, he had to win a large percentage of conservative white southern voters, so he could not be seen as progressive on race and have any chance at the southern vote. In hindsight, that foretold the Republicans’ “Southern Strategy” that took electoral voters from the formerly Democratic “Solid South” camp for election after election in the later part of the 20th Century. “The Making of a Catholic President” shows how the Kennedy camp came to realize the serious threat that JFK faced from anti-Catholic bigotry and how he and his strategists determined to confront the issue directly. Kennedy sought out and listened to Protestant leaders and then addressed their fears. Over and over during the primaries and the general election campaign JFK voiced his opposition to tax dollars for Catholic education, his opposition to an ambassador to the Vatican, and his commitment to the constitution of the country over the dogma of his faith. He entered the West Virgina primary, winning the votes of that overwhelmingly Protestant populace, then into the lions’ den of the Houston Ministerial Association, where he gave a speech and answered questions from that hostile Protestant audience. That event may be the most often recalled remarks by Kennedy about the impact of his religion on his actions in office. What is more interesting, and which deserves similar book-length treatment, are thoughts Casey brings up in his epilogue. JFK carried 83% of the Catholic vote in 1960, 34% of the white Protestant vote, and 50% of the regular-attending black churchgoers, but won the electoral votes of hugely Protestant Texas, perhaps in part thanks to running mate Lyndon Johnson. Even is one disavows some of the alleged moral failings that have come to light about JFK in the years since his assassination, considering the current climate of pressure on Catholic candidates from some of the American hierarchy and other corners of the church, one has to wonder if today JFK would be able to pull 83% of the Catholic vote, or if the fact that we now have had a Catholic president would take the cachet off electing a Catholic for Catholic voters. Casey’s epilogue offers cause for reflection for other, more important issues for today’s Catholic. First, the political independence of faith communities is good for both the faith communities and the nation. Second, endorsements of politicians by faith communities are usually misguided.